Meet the characters from the Cú Chulainn’s Challenge App and find out how to play the game. Download the new Discover Navan Fort Heritage app, free from the App Store. 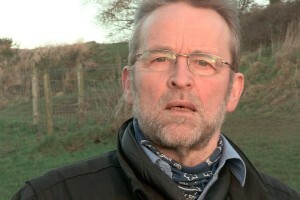 Let Cormac Ó hAdhmaill be your guide as you explore this unique historical location. The Discover Navan Fort Heritage app features presenter-led video clips that showcase the rich archaeological and mythological heritage of this important prehistoric site. 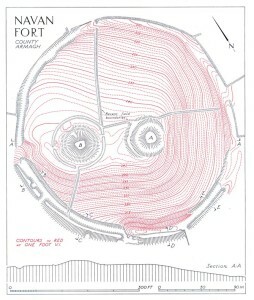 Videos are located at 11 information points around Navan Fort. 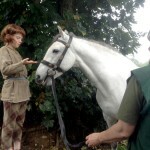 These videos are available in English and Irish and feature maps, reconstructions and re-enactments that relate to each location. 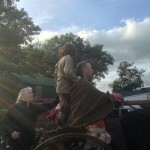 The site’s Late Bronze Age and Stone Age origins are explored and its association with the heroic Ulster Cycle revealed. 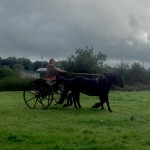 The app can be enjoyed anywhere but it is best experienced at Navan Fort Co. Armagh. 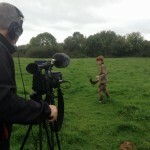 On location, at Navan Fort, GPS will trigger video content relating to your location, off location video is triggered by clicking the information points on the map. 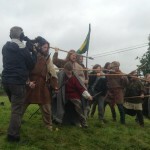 Download the app using a WIFI connection, and make your way to Navan Fort, which is situated 2 miles outside Armagh City. Choose your language; English of Gaelige and select your location. 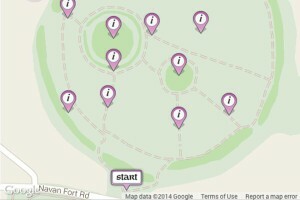 At Navan Fort: use the map to explore the location and locate information points. When you reach a point, video relating to that location will play. Off location, you can still view the videos by clicking on the information points. Cú Chulainn’s Challenge (formally known as Setanta’s Challenge) is now available, free to download, from the App Store for iPhones. 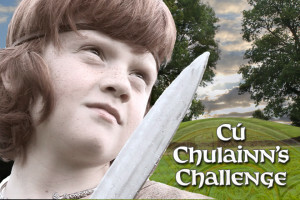 Cú Chulainn’s Challenge is an adventure game for children that explores the rich mythological heritage of Navan Fort / Eamhain Mhacha. This atmospheric app is available in English and Irish and uses video and audio to recount the heroic tales of Setanta/ Cú Chulainn. Navan Fort or Eamhain Mhacha is a place of of epic tales where great heroes have been made. 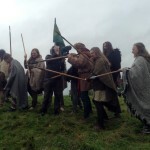 But the heroes of Eamhain Mhacha are in trouble – King Conor Mac Neasa and his Red Branch Knights are under a spell at the top of the mound. Only a warrior like Cú Chulainn, can help them to escape, but Cú Chulainn is away fighting! 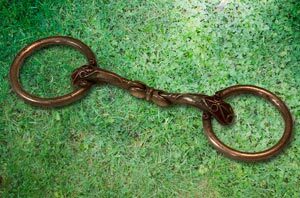 Can you find six of Cú Chulainn’s most treasured belongings that are hidden around Navan Fort? 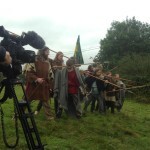 If you can, you will gain his strength and cunning and break Macha’s spell and free King Conor and his men. But it won’t be easy, Queen Méabh’s spies and soldiers are all around and they will try and take Cú Chulainn’s weapons and tools for themselves. Cathbhadh the druid, your spirit guide from the otherworld, will help you with your mission, use the map to find all six items to defeat Queen Méabh and to set King Conor free. 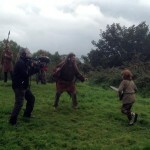 More information on getting to Navan Fort and playing the game is available on the Cú Chulainn’s Challenge App page. 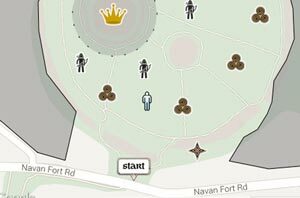 NB The app uses GPS to embed the game play at the historic site of Navan Fort and cannot be played elsewhere. The app will also be available for Android devices in the New Year. 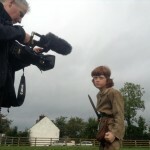 Setanta’s Challenge is the first of the two bilingual Navan Fort heritage apps. 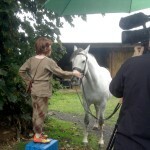 Setanta’s Challenge aims to bring the rich mythological heritage of Navan Fort to life for the under-12s. 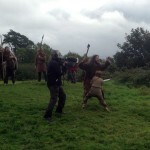 The app features an interactive treasure hunt and video footage that recount the adventures of Setanta/ Cú Chulainn at Navan Fort. 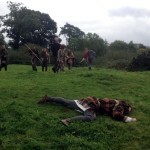 King Conor and his men are suffering from the curse of Macha and are trapped at the top of the mound. 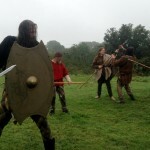 You must find Cú Chulainn’s weapons which are hidden around the fort to defeat Meabh’s spies and free King Conor and his men. Some background information on smartphone ownership in the UK to help better understand and target the appropriate audience for the Navan Fort Heritage apps. This is a summary of my blog post Tablet and Smartphone Ownership in UK and cites OFCOM’s latest reports: Market Communications Report July 2013 and Children and Parents: Media Use and Attitudes October 2013. The OFCOM Communications Market Report found that smartphone and tablet ownership in the UK had risen sharply and nearly three-quarters of all handsets sold (74%) in Q1 2013, were smartphones. Half of all adults (51%) in the UK now own a smartphone; although ownership varies significantly with age with three-quarters of 16-24 year olds (77%) compared to 11% of 65-74 year olds own a smartphone. The majority of smartphone owners (96%) use their device to access the internet and in Q1 2013, 49% of UK adults accessed the internet on their handset. In February 2013, nearly a third of webpage traffic (30%) came from mobile phones (23%) and tablets (8%) whereas desktop and laptop browsing declined by 20% . The OFCOM Media Use and Attitudes report found that 20% of 3-4 year olds, 22% of 5-7s, half of 8-11s and 89% of 12-15s had used a smartphone and smartphone ownership among under-16s had increased to 29%. The percentage of children owning a smartphone increases with the age of the child from 0% – 89%. Low ownership levels are recorded among 3-8 year olds but this begins to rise from the age of 9 years and outstrips non-smartphone ownership by the age of 11. Only 1% of 5-7 year olds, 18% of 8-11s and 62% of 12-15s own a smartphone. The OFCOM Communications Market Report found that tablet ownership had more than doubled to 24% of UK households, and 29% of NI households. However, just under half (46%) of these tablets are 3G-enabled and only 20% of tablet owners have a mobile subscription for a 3G connection. Three-quarters (76%) of parents owning tablets consider them a useful tool for entertaining and/or educating their children. Four in five parents said their children used a tablet computer at least weekly, with two in five reporting daily use by their children and 17% saying their children use it more than once a day. The OFCOM Media Literacy October 2013 report found that children’s access to tablets had doubled, with half of households with 3-15 year olds owning a tablet. 42% of 5-15 year olds and one-quarter (28%) of 3-4s use a tablet computer at home. Almost a quarter of children use tablets to access the internet and 12% of 3-4 year-olds have used a tablet computer to go online. Tablet ownership among children increases with age; 3% of 3-4 year olds, 13% of 5-7s, 18% of 8-11s and one-quarter of children aged 12– 15 (26%) have their own tablet computer. BESA, the British education suppliers association, surveyed 500 UK schools and found that 6 per cent of all pupil-facing computers in schools are tablets (4.5 per cent in primary, 6.9 per cent in secondary). The schools surveyed, forecast that by the end of 2013 the percentage of tablets will have risen to 10% and by the end of 2015 this is predicted to rise to 24 per cent of all pupil-facing computers. The Iron Age is defined in Ireland by the introduction of the La Téne design of metalwork, a style that is closely associated with the Celts. The finds from this period such as ornaments, horse tack and weaponry are associated with aristocratic members of society. 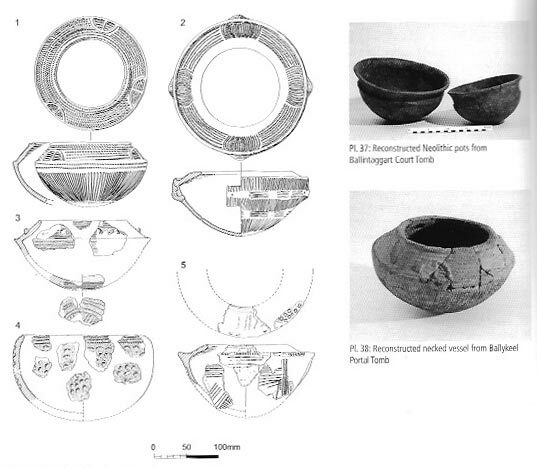 There is little evidence of Iron Age settlement in Ireland apart from at the ‘royal’ sites of Tara, Co. Meath, Dún Ailinne on the hill of Knockaulin, Co. Kildare and Navan Fort. Again there is little burial evidence from this period, suggesting cremation was the most common method and the few grave goods found consisted of personal possessions such as pottery or weapons. Around Navan Fort, there was a resurgence of woodland c. 200 BC suggesting the collapse of agriculture, abandonment or population decline. The forest regeneration coincides with a rise in lake levels suggesting an increase in rainfall. 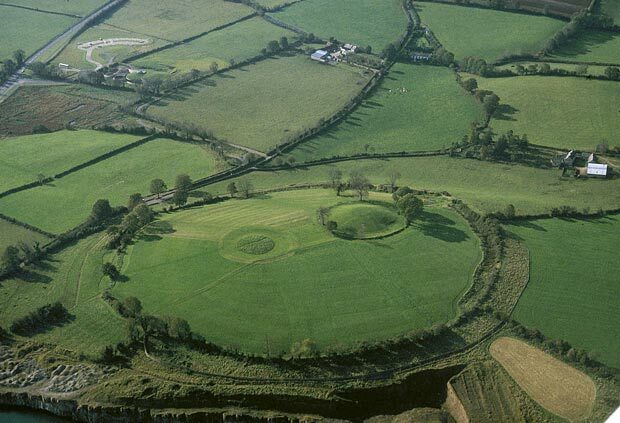 These climatic changes coincide with an upsurge in ceremonial activity including the building of the mound at site B on Navan Fort and the deposition of the trumpets in Loughnashade. By the first or second centuries AD this decline was reversed and arable agriculture was again on the rise. The number of bronze and gold ornaments and the hundreds of bronze spears and swords discovered from the Late Bronze Age suggest that society had become aristocratic and warlike. Burial patterns changed to be replaced by some unknown ritual. The few burials that have been discovered consist of cremations placed in a mound surrounded by a ring ditch. The increase in the number of Late Bronze Age hoards discovered suggests that a person’s wealth was publicly offered rather than buried with them. The majority of hoards are found in wetland areas suggesting the ritual of depositing precious objects in bodies of water. There is little evidence of settlement from this period apart from hillforts which suggest political instability and the development of larger societies. 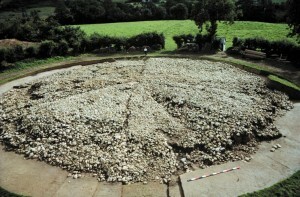 The evidence of Late Bronze Age occupation in Co.Armagh is limited to the Navan complex which includes settlement at Navan Fort and Haughey’s Fort, the King’s Stables ritual pool and the linear earthworks at Creeveroe. 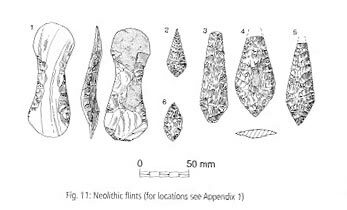 The main characteristics which distinguish the Neolithic period and the Early Bronze Age are seen in changes in pottery shape and use, refinement of flint heads for more effective hunting (ie barbed-and-tanged arrowhead) and the introduction of metal implements. There is little evidence of Early Bronze Age settlement in Ireland, but the few remains suggest that it consisted of small groups of rectangular and circular dwellings surrounded by timber palisades. These farmsteads would have been spread out in a patchwork of clearings surrounded by forest. A change in burial patterns at this time suggests a shift in societal focus from the communal to the individual. 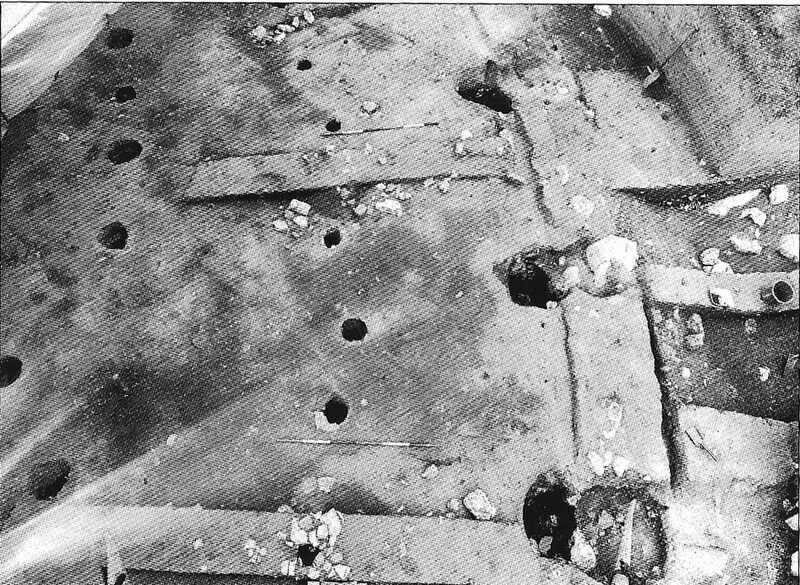 The dead were either interred in a pit or stone cist or their cremated remains were deposited in an urn or other funeral pottery before internment. Grave goods included weapons, tools, ornaments and animal bones. Early Bronze Age metalwork began with the production of simple copper and bronze axes and daggers and some gold ornaments. 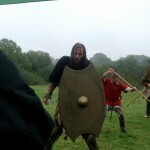 As the age progressed, more elaborate axes, longer daggers, halberds and spears were produced. These metal weapons were the preserve of the higher ranking members of the society whereas the rest of the community used a bow and arrow for hunting or fighting. The beginning of the Bronze Age witnesses another phase of woodland regeneration followed by more clearance. 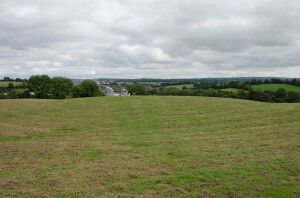 Navan Fort witnessed a substantial forest clearance around 1900BC suggesting the expansion of arable agriculture in the vicinity. Pollen finds from Loughnashade indicate an increase in arable cultivation in the early part of the Bronze Age 1900-1000BC. This coincides with the criss cross grooves made by ploughing on the surface of the hilltop at site B. 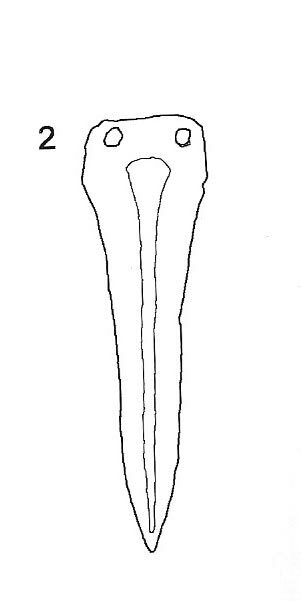 An early, rather thick example of a dirk ( a long dagger) is supposed to have been found near ‘the great Navan Rath’. The Neolithic period is marked by substantial changes in settlement pattern, technology, method of burial and the organisation of society. An economy based on hunting, fishing and gathering is replaced by one that focuses on the rearing of domestic livestock and the cultivation of cereals. After 4000BC, housing became more permanent, clay-built pots were used and the range of available equipment increased to include tools for clearing forests and reaping and processing grain. Large stone structures known as megaliths were built to serve as religious centres and to house the dead. The spread of megalithic tombs suggests that these farming communities were based in upland areas, living in small groups in rectangular houses. The analysis of contemporary pollen demonstrates that prior to the Neolithic period, Ireland was densely wooded. By 3900BC, woodland had declined and was replaced by cereals and grass indicating that farmers had cleared the woodland for growing crops and raising cattle and pigs. These clearances were sporadic and there are periods of forest regeneration throughout this age. 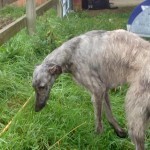 This is the first phase of human activity at Navan. The remains of at least 19 Neolithic pots and an assortment of stone tools including flint scrapers and stone axes were found at site B, although the only evidence of building was a single pit and some charcoal-stained soil. Additional Neolithic finds were discovered during the building of the Navan Centre which included flint flakes, a plano-convex knife and a flint axe. Navan Fort is situated on a drumlin outside Armagh City in a rich archaeological landscape that includes Haughey’s Fort, The King’s Stables and Loughnashade. Navan Fort is identified as Emain Macha, the legendary capital of Ulster, celebrated in the heroic tales of the Ulster Cycle and comparable to other royal sites in Ireland. 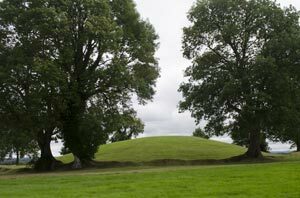 According to tradition, Knockaulin (Dún Ailinne) in Co. Kildare was the site of the inauguration of the Kings of Leinster, Tara in Co. Meath was associated with the Kings of Meath and Navan Fort was known as the seat of Kings of Ulster. The Navan Fort complex shows evidence of occupation dating back to the Neolithic period, but its the evidence from the Late Bronze Age and Early Iron Age that reinforces Navan Fort’s importance as a regional centre.